Big Splash Adventure Indoor Water Park and Resort opened in March of 2009. We are located in beautiful French Lick Indiana high on a hill with a gorgeous view. The 40,000 square foot water park is enclosed in a glass structure which provides a tropical atmosphere year round. We are the largest water park in the United States with a retractable roof. Our water park has many different water attractions for kids of all ages. 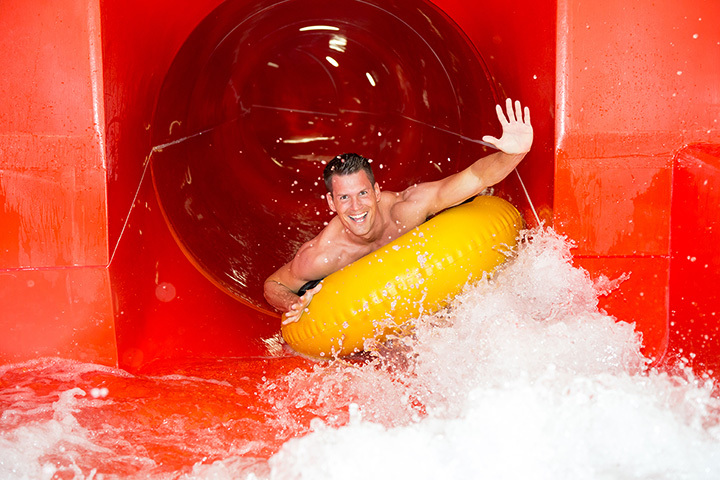 Features include a 40ft slide tower complete with four thrilling and daring water slides. One slide even thrusts riders into a large bowl where they spiral out of control. Riders can float through the story of Uncle Lee Wally and his rag tag crew as they sail to find buried treasure. A three story Bucaneer Bay with over 50 interactive water features including a 1,000 gallon dumping bucket. Our Splish Splash pool is perfect for smaller children with bouncing swings and a small slide. We even have an adult’s only Palm Cove hot tub. There are multiple dining venues, Treasure Chest arcade, and Seaside Market gift shop. Our 154 room hotel features a wide variety of rooms including two room suites and several rooms contain bunk beds. Each room comes with water park passes, flat screen televisions, and a complimentary hot breakfast! Big Splash Adventure and Indoor Water Park and Resort is the perfect family destination year round!